Eve La Salle Caram and Cecil­ia Manguer­ra Brainard, award­ed authors and long-time teach­ers of Cre­ative Writ­ing, team up in writ­ing two novel­las for the Spe­cial Inter­na­tion­al edi­tion pub­lished by PALH (Philip­pine Amer­i­can Lit­er­ary House). The book is beau­ti­ful­ly illus­trat­ed by Nina Lim-Yuson and designed by C. Sophia Ibardaloza. Caram’s and Brainard’s pro­tag­o­nists are women who jour­ney to Rome and Paris and find cre­ativ­i­ty, love, and heal­ing. 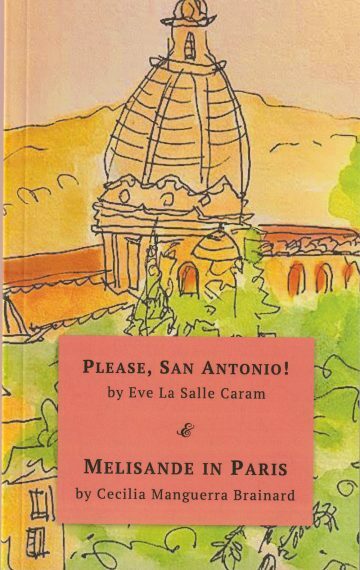 “In Eve La Salle Caram’s Please, San Anto­nio!, an emo­tion­al­ly iso­lat­ed Amer­i­can woman’s trip to Rome becomes a pow­er­ful quest to find what she has lost: her cre­ativ­i­ty, iden­ti­ty, and “an open place in her heart. “In Cecil­ia Manguer­ra Brainard’s Melisande in Paris, a young seam­stress from the French coun­try­side comes to Paris to assist her dress­mak­er aunt, and redis­cov­ers her tal­ent, strength, and a pre­cious “feel­ing of whole­ness” in her new lover’s arms. Eve La Salle Caram is the author of five nov­els, those in her book Trio, A Cor­pus Christi Tril­o­gy, and the inter­con­nect­ed duo of The Blue geog­ra­phy and Win­ter­shine. She is also the edi­tor of Palm Read­ings, Sto­ries from South­ern Cal­i­for­nia, a mul­ti­cul­tur­al anthol­o­gy of sto­ries by South­ern Cal­i­for­nia women. For over thir­ty years she has taught Lit­er­a­ture and Writ­ing at Cal­i­for­nia State Uni­ver­si­ty, North­ridge, and Fic­tion Writ­ing at UCLA Extension’s renowned Writ­ers’ Pro­gram where she won the Out­stand­ing Instruc­tor in Cre­ative Writ­ing in 2006. She also teach­es at Los Ange­les City Col­lege whose stu­dents helped inspire her nov­el, Rena, A Late Jour­ney, and who asked her to write Look­ing for John­ny, the short nov­el that com­pletes Trio. All of her books have been used in Lit­er­a­ture and Writ­ing class­es in Cal­i­for­nia and in Texas. Cecil­ia Manguer­ra Brainard has writ­ten three nov­els: When the Rain­bow God­dess Wept, Mag­dale­na, and The News­pa­per Wid­ow. She has also writ­ten and edit­ed eigh­teen oth­er books. Cecil­ia has received a Cal­i­for­nia Arts Coun­cil Fel­low­ship in Fic­tion, a Brody Arts Fund Award, a Spe­cial Recog­ni­tion Award for her work deal­ing with Asian Amer­i­can youths, as well as a Cer­tifi­cate of Recog­ni­tion from the Cal­i­for­nia State Sen­ate, 21st Dis­trict. She has also been award­ed by the Fil­ipino and Fil­ipino Amer­i­can com­mu­ni­ties she has served. In 1998, she received the Out­stand­ing Indi­vid­ual Award from her birth city, Cebu, Philip­pines. She has received sev­er­al trav­el grants in the Philip­pines, from the USIS (Unit­ed States Infor­ma­tion Ser­vice). In 2001, she received a Fil­ip­inas Mag­a­zine Award for Arts. Her books have won the Gour­mand Award and the Gin­tong Aklat Award.